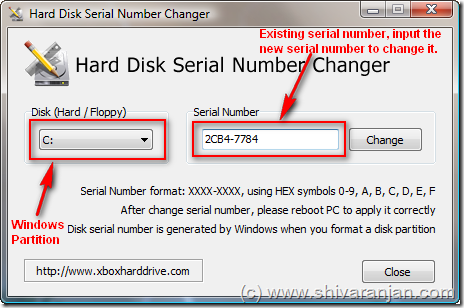 Hard Disk Serial Number Changer is a free tool that will allow you change the serial number of the Windows partitions in the hard disk drive without formatting. Normally if you want to change the serial number of a partition then would have to format the partition. The name of the tool is slightly misleading as it gives a impression that the serial number of the hard disk drive itself will be changed whereas that is not the case as this tool only changes the Windows partitions serial number. The serial number format is XXXX-XXXX, using HEX numerals 0-9, A, B, C, D, E and F. NTFS, FAT, and FAT32 file systems are supported by this tool, once you change the serial you would have restart your computer for the changes to take effect. This tool lets you do that without having to format the partition hence this can prove very useful at times. This tool doesn’t not require any installation hence it is a portable application. Warning: This is tool is to be used only by advanced users, if you run this tool without knowing the consequences your computer may get screwed up and even may fail to boot up.